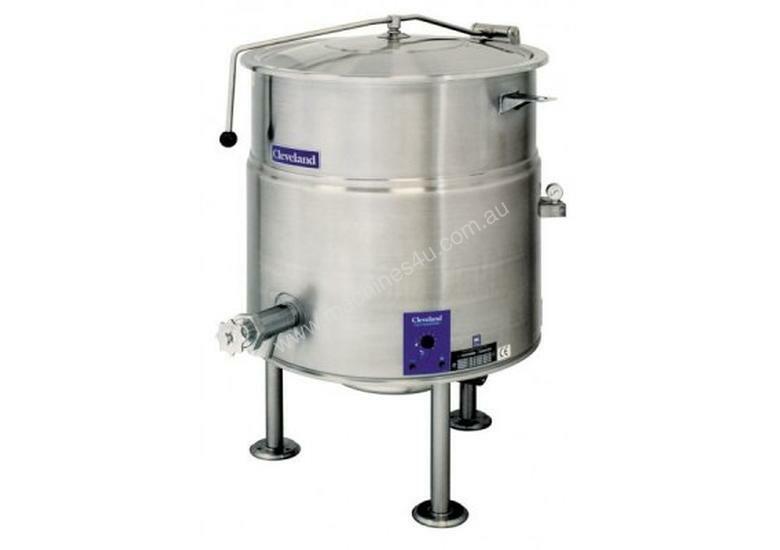 Electric self contained stationary kettle with 375 lt capacity, 2/3 steam jacketed. Solid state controls for accurate temperature control (+/- 1 degree C) and low water safety.••Supplied with 50mm tangent draw-off valve with drain strainer and spring assisted cover. The Cleveland KEL-100 steam kettle is a tri-leg stationary electric kettle with a 2/3 self contained steam jacket which is permanently filled with treated water so venting and/or refilling is not required. The kettle and supports are made from type 304 stainless steel. Cleveland's stationary kettles come standard with a spring assisted domed cover and 2`` no drip tangent draw-off valve. With a 50 psi steam jacket rating the Cleveland KEL-100 has higher steaming temperatures for faster cooking and superior browning. The 2/3 steam jacket is perfect for even temperatures, fast heat up and recovery and your foods won't scorch or burn like they often do in stockpots. Precise + 1°, solid state splash proof temperature controls are perfect for delicate products and tightly controlled food product. The Cleveland KEL-100 is also ideal for holding products to temperature .